Can this university save bluefin tuna from extinction? They're fast, strong and can weigh up to 1,000 pounds -- but Pacific bluefin tuna are no match for today's tech-savvy fishing rigs. The population of Pacific bluefin tuna has tumbled to 2.6% of pre-fished levels, but one university in Japan has found an answer. "Japan is the largest consumer of tuna in the world, and we are feeling a sense of crisis," said Syunichi Kanke, a lab worker at Kindai University Aquaculture Research Institute. 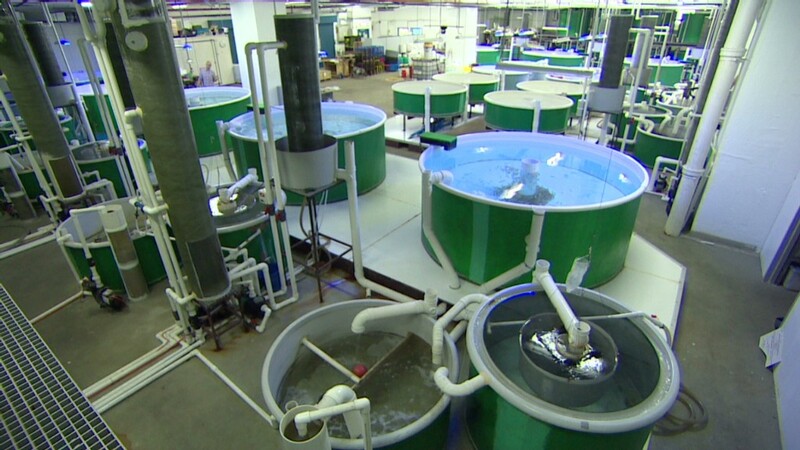 Kindai University is a leader in fish farming -- the practice of raising fish in enclosures. It has been working on a sustainable solution since being established in 1948. The plan? Completely artificially raised fish. It's a two-generation process that Kindai started in 1979. First, scientists would collect eggs from captive adult fish, artificially inseminate them in the lab, wait for the eggs to hatch into larvae, and raise those larvae until adulthood. Once the larvae grew to adulthood and laid eggs, theoretically, the scientists would simply repeat the process -- and voilà -- full-cycle farmed fish. But it wasn't quite so straight-forward. Due to tuna's suicidal tendencies and low larvae survival rates, it took over three decades to reach this crucial milestone. 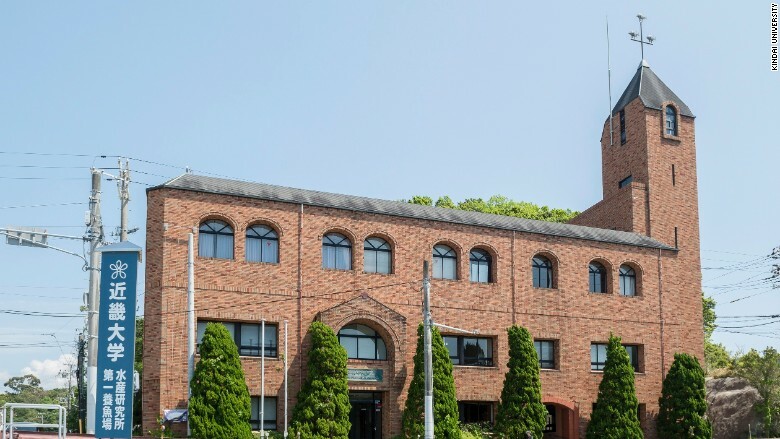 Opened in 1948, Kindai University's head office of Aquaculture Research Institute is located in Wakayama, a coastal area that's about 50 miles (80km) south of Osaka. In 2002, Kindai University finally succeeded. Using fertilized eggs from the artificially hatched, farm-raised parents, the university produced the world's first generation of fully farmed Pacific bluefin tuna. Today, the university sells its harvest to restaurants and distributors all over the world, with an aim to supply half of Japan's Pacific bluefin tuna consumption by 2020. In the 1960s and '70s, Kindai University had already successfully farm-raised Japanese flounder, Silver bream, Japanese parrot fish, yellowtail, amberjack and more. But farming tuna proved to be a different story. The "porsche of the sea" are powerful creatures, making them difficult to handle in aquaculture farms. They also have hyper-sensitive reactions to stimuli, such as sound and light. If upset, they are known to swim at 30 miles an hour into nets, usually dying on impact. To keep fish alive, scientists installed smart lighting systems, developed a new feed, and built large circular holding pens to thwart suicide attempts. Since Pacific bluefin tuna do not breed regularly in captivity, the scientists harnessed artificial insemination to spawn fish larvae. But it took decades of trial and error to cultivate the fry to adulthood, harvest their eggs and produce the world's first full-cycle farmed fish. 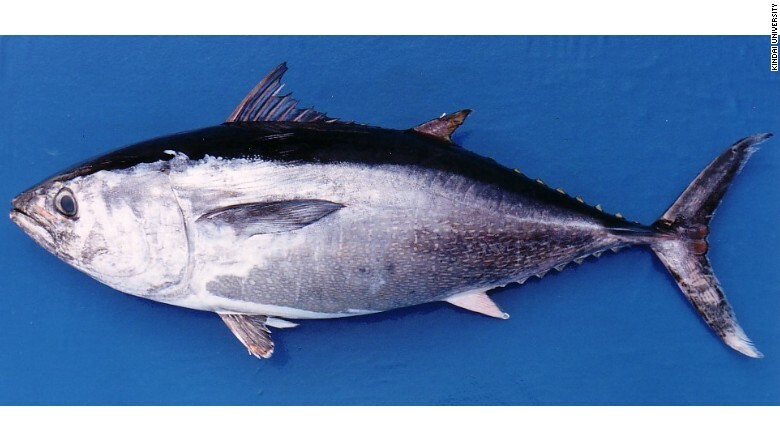 Now producing its third generation of fully cultured Pacific bluefin tuna, the university's output is growing steadily. By the end of 2016, Kindai expect to have cultivated 50,000 juveniles -- over 25 times its harvest just 10 years ago. Located in Wakayama, an hour south of Osaka, the Kindai University fish farms cultivate red sea bream, striped jack, kelp grouper, yellowtail, amberjack, and Pacific bluefin tuna. While a global appetite for Pacific bluefin tuna contributes to the problem, Japan has been singled out as the world's top consumer. The country devours 80% of the world's tuna -- or about 40,000 tons annually. The tuna's fatty, melt-in-your mouth texture makes it a fixture on sashimi menus, and demand has taken a toll on the prized fish. Kanke said aquaculture -- specifically this full-cycle process -- is the only realistic solution, as it's unlikely dining habits will change in the near future. While not perfect, it's a more sustainable alternative to traditional fisheries, which catch juveniles in the wild and move them into cages. Kindai is also researching ways to make the Bluefin grow faster and stay fresher, by mapping DNA from blood samples to identify fish with the best genes. "Since we have these fish for their entire lives, we have a much better understanding about them than before," said Kanke. "We can make better decisions about what we feed the fish and how we care for them, resulting in higher quality fish." A Pacific bluefin tuna, farmed by Kindai University Fisheries Laboratory in Wakayama Prefecture, about 50 miles (80km) south of Osaka. Today, aquaculture is a booming business in Japan. 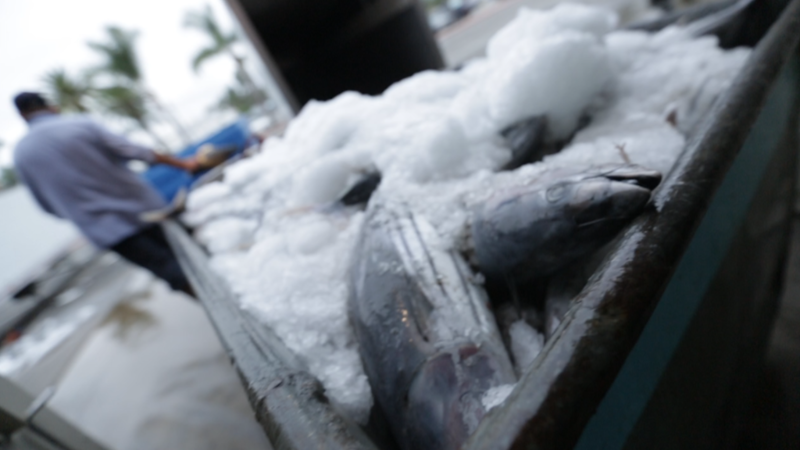 Every year, the university ships juveniles to commercial fisheries across the country -- many of which operate full-cycle farms, following Kindai's lead. At the same time, the university sells 2,000 adult fish a year to distributors for consumption, mostly purchased by Aeon -- Japan's largest supermarket chain. The university also runs two educational restaurants -- one in Tokyo and another in Osaka -- where diners can try the farmed fish and learn about the process. Part of the profits from the restaurants are then invested into the university's research and development, providing a sustainable business model. 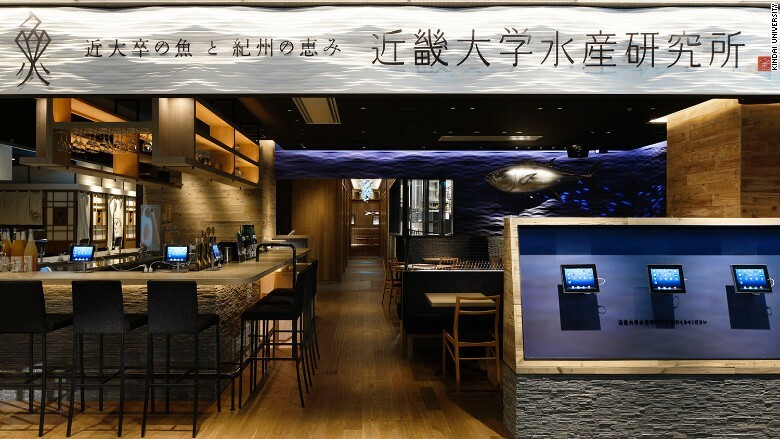 Kindai University Fishery's Restaurant in Osaka offers a chance to taste the farm-raised fish, as well as learn more about the research projects. 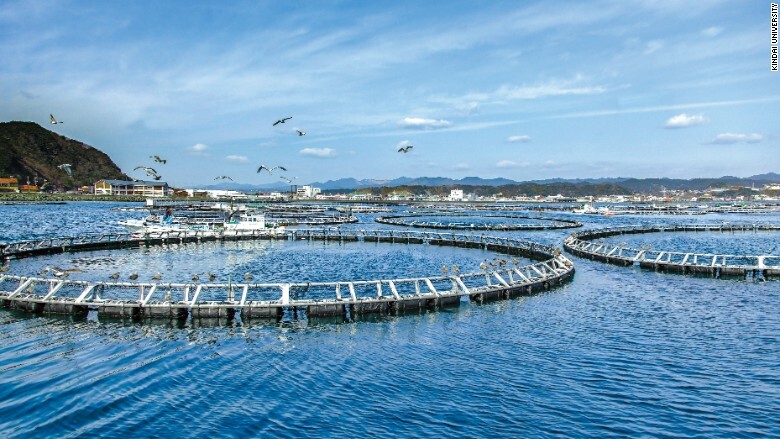 While Kindai has made huge advancements in the aquaculture industry, there's still one aspect that they haven't quite cracked. Tuna consume an incredible amount of feed -- approximately 11 ponds of mackerel per 220-pound fish, every day. In order to avoid depleting mackerel stocks, the university is researching artificial feeds and has already incorporated vegetable proteins into the mix. By experimenting with the feed, researchers have been able to maintain an ideal fat-to-protein ratio, which may lack the nuances of wild fish but is more consistent. 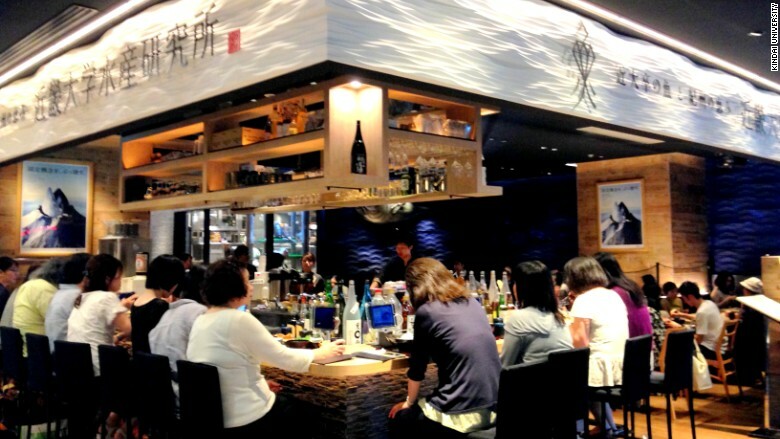 Located in Ginza in Tokyo, Kindai University Fishery's Restaurant opened in 2013. It specializes in sashimi, serving red sea bream, tuna and more -- all from the fisheries lab in Wakayama. Looking toward the future, Kindai University has ambitions to increase its output to 150,000 tuna a year -- which would satisfy roughly half of the Japanese market. In the meantime, Kindai expects its output to triple over the next few years. "It's unlikely that people will stop eating tuna with the global population increasing," said Kanke. "The government must keep catch regulations in place and we need to keep pushing to mass-produce fully cultured tuna."